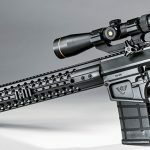 Wilson Combat’s new Super Sniper, chambered in .308 Winchester/7.62mm NATO, delivers the firepower and accuracy that long-range tactical engagements demand. Shown with a Leupold 4-12x40mm VX-R scope. Despite gusting crosswinds at the range, the Super Sniper delivered 1-MOA groups on average out to 300 meters when firing from prone. Wilson Combat’s free-floating TRIM handguard allows shooters to mount accessory rails where needed, leaving the rest of the forend slim and lightweight. 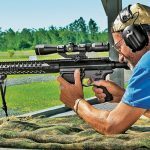 The author’s test Super Sniper came with a 20-inch, unfluted bull barrel with a 1-in-10-inch twist rate and a target-style reverse crown for consistency. 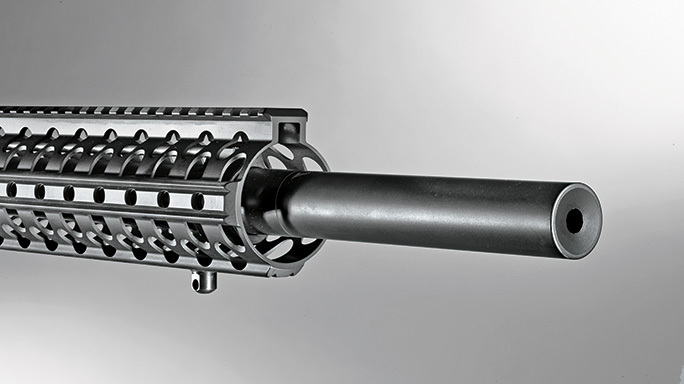 The upper and lower receivers are given Wilson’s durable Armor-Tuff finish. Also note adjustable Super-Stoc and the “Starburst” texturing on the pistol grip. 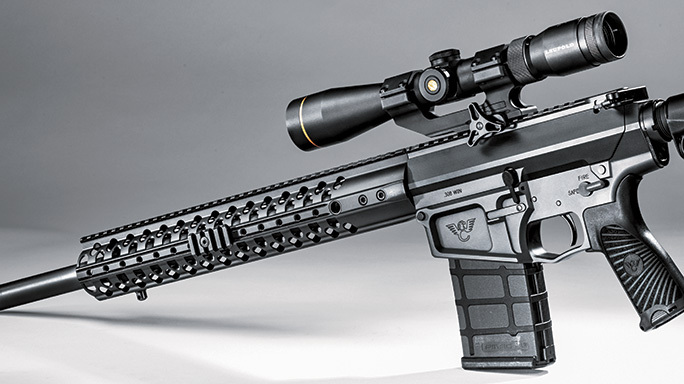 Wilson Combat has a well-earned reputation for producing innovative, high-quality firearms, from custom-grade pistols and shotguns to ARs in a number of chamberings, and the new Super Sniper in .308 Winchester/7.62mm NATO fully lives up to the company’s reputation. 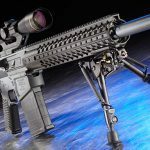 This rifle delivers everything a designated marksman, hunter or competitor could ask for in a long gun intended to deliver sustained precision fire on one or more targets out to the limits of the .308 Winchester cartridge. The Super Sniper’s tactical features and attention to detail make it one of the best AR-pattern sniper rifles and put it on a par with many of the best bolt-action guns. In fact, it’s actually superior to turnbolts for many precision rifle missions performed with a 7.62mm. These missions often involve firing on multiple hostile targets that move as they engage our troops or law enforcement officers in urban settings. The Super Sniper’s ability to send 20 precisely targeted rounds downrange in quick succession makes it far superior to a five-shot bolt gun for interdicting this type of threat. Precision targeting demands accuracy, and the Super Sniper has a number of features that promote good bullet placement. They begin with the rifle’s match-grade Wilson barrel. My test rifle featured an unfluted bull barrel that was button rifled with a 1-in-10-inch twist rate, which is ideal for stabilizing the heavier and more aerodynamic 175-grain match bullets that are popular with snipers. The barrel is made of 416 stainless steel and it has a target-style reverse crown. Put these features together and you have a stiff barrel that dampens vibrations, resists heat warp, has match-grade rifling and sports a crown that cleanly releases each and every bullet. These features by themselves are sufficient to make most rifles quite accurate. But Wilson Combat goes much further. The Super Sniper’s BILLet-AR upper and lower receivers are machined to very close tolerances. 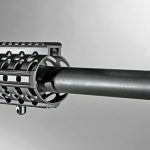 When assembled, the upper and lower receivers provide a stable platform for the barrel that won’t shift when the rifle is fired. In addition, the bolt raceway in the upper receiver is precisely machined. This helps reliability, but it also ensures that the bolt will place every cartridge in the same position in relation to the bore. That’s very important for consistent accuracy. 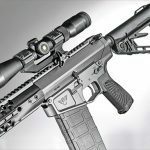 Three other accuracy-promoting features of the Super Sniper are its Wilson TRIM handguard, Wilson Tactical Trigger Unit and its lockable Rogers Super-Stoc. The TRIM rail is free-floating, so there’s no pressure on the barrel that could degrade accuracy. The Tactical Trigger Unit has a single-stage trigger that is clean and precise. The one on the rifle provided for testing consistently broke at exactly 4 pounds (that’s a specific tuning for the Super Sniper WC rifle) on my RCBS trigger pull gauge. 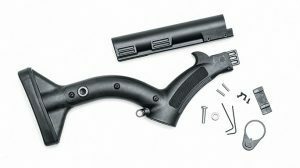 Finally, the Rogers Super-Stoc solves a problem that’s encountered with many tactical rifles that have telescoping stocks: play between the lower receiver extension and the stock. This can cause the stock to shift during recoil. 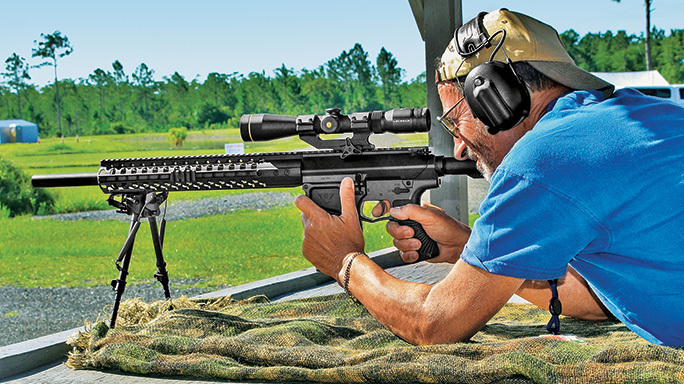 Even a minor shift in the stock can place the sights in a different position in relation to the shooter’s eye, and this can affect shot-to-shot accuracy. The Rogers Super-Stoc has a lever that firmly locks the stock to the receiver extension, giving the shooter a solid platform with which to work. I field-stripped the Super Sniper and closely examined its overall exterior and interior fit and finish. The exterior was flawless. The green/gray Armor-Tuff finish on the barrel and receiver was evenly applied and complemented the matte black of the rifle’s furniture. There were no poorly conformed lines, sharp edges, scratches, burrs, tool marks or other exterior flaws in workmanship. When I disassembled the rifle for cleaning, the interior surfaces were also free of any defects. The rifle’s high degree of quality was also reflected in how it handled. All of the controls operated smoothly. When the bolt was released, it moved smoothly forward and locked up with a solid sound, and there was no annoying clang from the buffer tube spring when the bolt drove home. The charging handle glided back and forth, cocking the action with moderate effort. This definitely is not a rifle requires its operator to wrestle with its controls when it’s run from the prone position. Quality glass and mounts are essential on a sniper rifle. 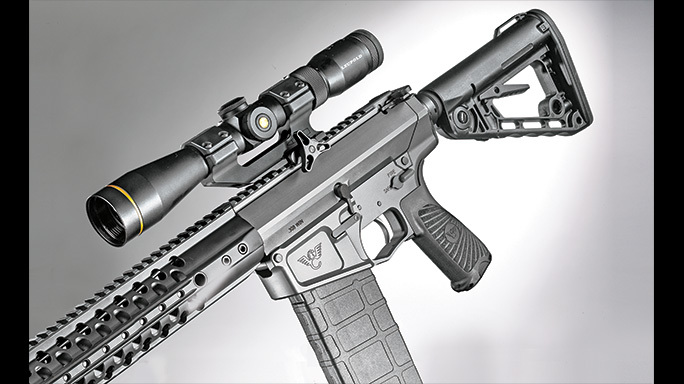 The test gun came from Wilson Combat with a Leupold 4-12x40mm VX-R scope mounted in a sturdy Wilson one-piece mount (both are available at extra cost). The VX-R has Leupold’s Index Matched Lens System. All lenses are individually multi-coated for maximum light transmission, and the lens edges are blackened to reduce glare. The scope is waterproof, is filled with second-generation argon/krypton gas, and has and Leupold’s ballistic “Firedot” reticle. When the button in the center of the scope’s left turret is pressed, a lighted red Firedot appears at the crosshairs. The dot is bright and very visible, yet it is small enough to provide a precise point of aim. The bottom crosshair also has two holdover hash marks. They are not illuminated on this particular scope, but Leupold does make version of the VX-R that has illuminated holdover marks. These marks help estimate bullet impacts at 200 and 300 yards when the rifle is sighted in with .308/7.62mm ammo at 100 yards. When a 175-grain Sierra MatchKing bullet was used, both hash marks were very close to being dead-on. This particular VX-R scope has an MSRP of $749. That’s very reasonable given its excellent performance. On the firing line, the Super Sniper clearly lived up to its name. The rifle was comfortable to shoot, it was accurate, and it generated good velocities with match-grade ammunition. I chose three loads for testing: Black Hills’ Gold Match load with Hornady’s 168-grain A-MAX bullet, another Black Hills load with a 175-grain Sierra MatchKing OTM bullet and Gorilla Ammunition’s 175-grain match ammunition, which also uses a MatchKing bullet. At the range, I placed targets at 100 yards and 300 meters. During much of the testing, a quartering 8- to 12-mph wind was gusting from over my left shoulder. I took my shots during the calmest periods, but wind velocity can vary significantly between the firing line and the target. Given this, the groups probably would have been smaller on a calmer day. I fired three 5-shot groups with each of the three loads at 100 yards. The smallest 100-yard group, produced with the Black Hills Gold load, measured 1 inch. All three groups fired with this load showed very little variation in size, indicating that the Super Sniper definitely liked this load. Groups fired with the 175-grain loads ranged between 1 and 1.6 inches. Given the wind, this was good overall performance. At 300 meters, the Super Sniper maintained its tight groups. I fired two 5-shot groups using the 175-grain Gorilla rounds at this distance. My targets were PR-B21E silhouettes from Law Enforcement Targets. Since the targets were at 300 meters, I placed the Leupold scope’s 300-yard hash mark at the top of the 10 ring in the center of the chest. Both targets had most hits in the lower portion of the 10 ring, with one bullet in the nine ring, just outside the 10. The first group measured 3.24 inches and the second measured 3.29 inches. On a gusty day, 1 MOA at 300 meters is more than acceptable performance. I used a Competition Electronics chronograph to measure each load’s velocity. The readings were consistent with velocities from other .308s with 20-inch barrels. 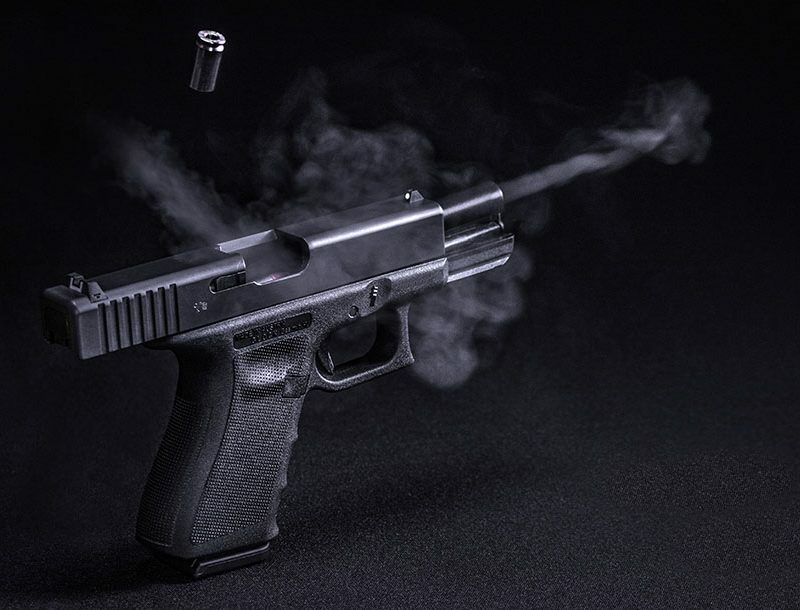 The 168-grain bullet exited the muzzle at an average of 2,554 fps. The 175-grain Gorilla load averaged 2,425 fps, and the 175-grain Black Hills load averaged 2,485 fps. The 175-grain Sierra MatchKing has a ballistic coefficient of nearly 0.5. At these velocities, the MatchKing is only between 18 and 20 inches low at 300 meters, and the bullet still has over 1,400 foot-pounds of energy. Considering the velocity, accuracy and energy together, the performance at 300 meters was very good. A trained sniper using this Wilson rifle should be able to take full advantage of the .308 out to 500 meters, if not farther. Since this is a sniper rifle, I conducted one final field test. I shot two PR-B21E targets set out at 200 yard from the prone position using a Harris bipod. I fired five chest shots on each target with the 168-grain Black Hills Gold load. All shots hit in the torso and seven of the 10 were in the heart region. Putting all 10 rounds on target at 200 yards clearly demonstrates that it’s very easy to shoot well with the Super Sniper. 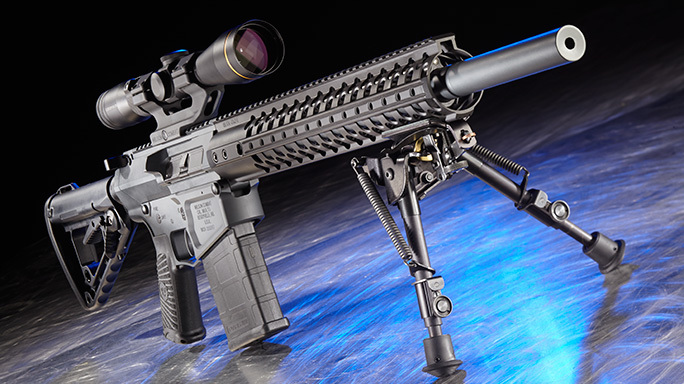 Wilson’s Super Sniper delivers everything one could expect from a semi-auto .308/7.62mm sniper rifle. It is meticulously manufactured and has every feature one needs for precision shooting. It also delivers fire on target much more rapidly than bolt-action sniper rifles, is very accurate and isn’t excessively heavy. When combined with the Leupold VX-R scope and its lighted Firedot reticle, its user can take full advantage of fast holdover adjustments day or night. 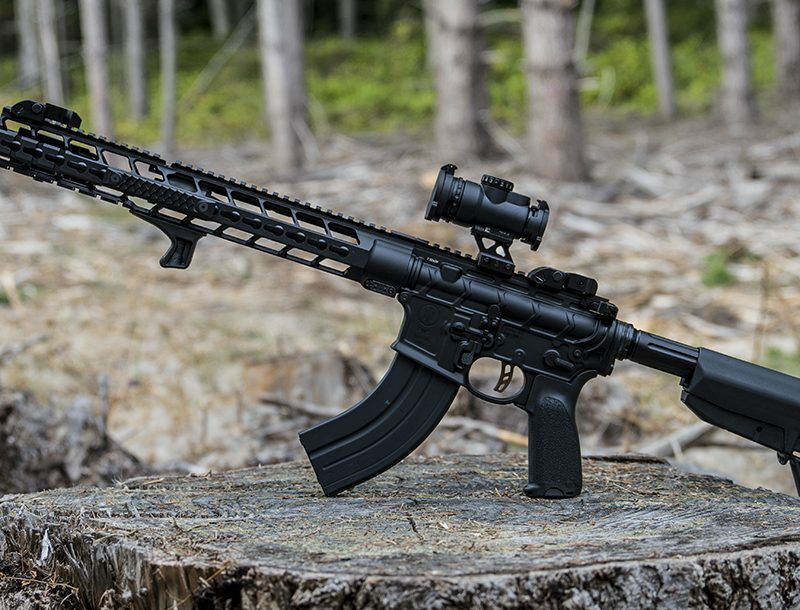 At about $4,000, this rifle and scope combination isn’t cheap. On the other hand, this rifle is capable of performing its intended mission of quickly neutralizing multiple long-range threats in urban environments where targets move quickly and can hide behind plenty of cover.